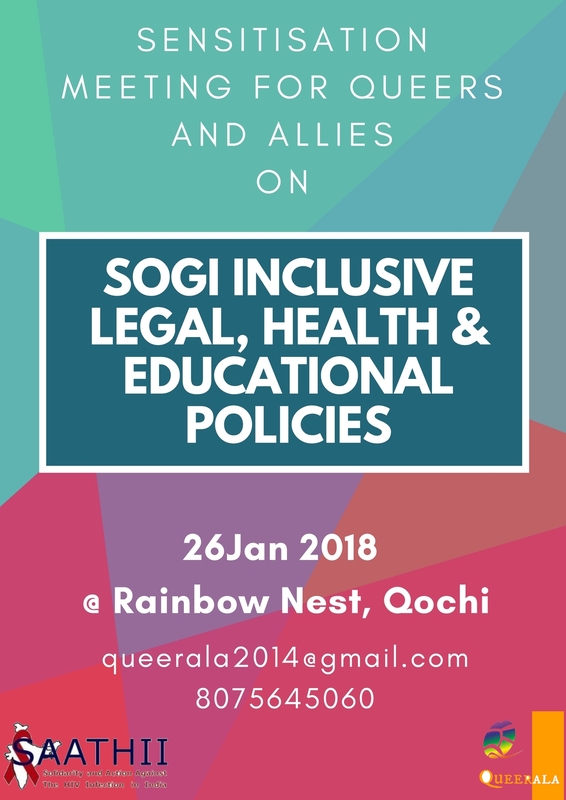 Queerala, invites LGBTI individuals and allies for a training/sensitization meeting on ‘Inclusive Legal-Health-Eductional Policies’, on 10am-4pm, 26Jan 2018. The one day program , being organized as a part of Project Vistaara-in collaboration with SAATHII(Solidarity and Action Agianst HIV Infection in India)- is an attempt to bring emphasis on the possible forms of SOGI(Sexual Orientation and Gender Identity) Inclusion across the legal, health and educational frameworks in our state. Insights on NALSA judgment’ implications, relevance of IPC Sec.377, results of certain case studies on issues pertaining to SOGI shall also be presented at the gathering. We expect the discussions of the program would be taken forward to liaison with authorities across concerned govt departments to implement inclusive civil systems in Kerala, while empowering LGBTI individuals on the possible options on SOGI Inclusion. Queers and Allies, Sensitization Meeting.